Back in early March my family and I hiked up Hugo Peak at the Charles Lathrop Pack Experimental and Demonstration Forest in Eatonville, Wa. The hike was easy (about 5 miles round trip) and the trail climbed gradually up through some clear cuts and older growth forests. All in all, it was a nice outing, though there wasn’t much in the way of a view except for about halfway when the trail traverses a clear cut and you can see northwards fairly well. The plusses: you don’t need to pay to access Pack Forest. The minuses: the facilities at the trailhead of the Hugo Peak Trail are in rough shape. The bathroom was out of order (because of vandalism) the last few times I visited. A rare view taken from Hugo Peak Trail on the way up. = The trail encounters some moderate uphills, however, the 2.5-mile length to the summit makes for a nice family outing with young hikers. 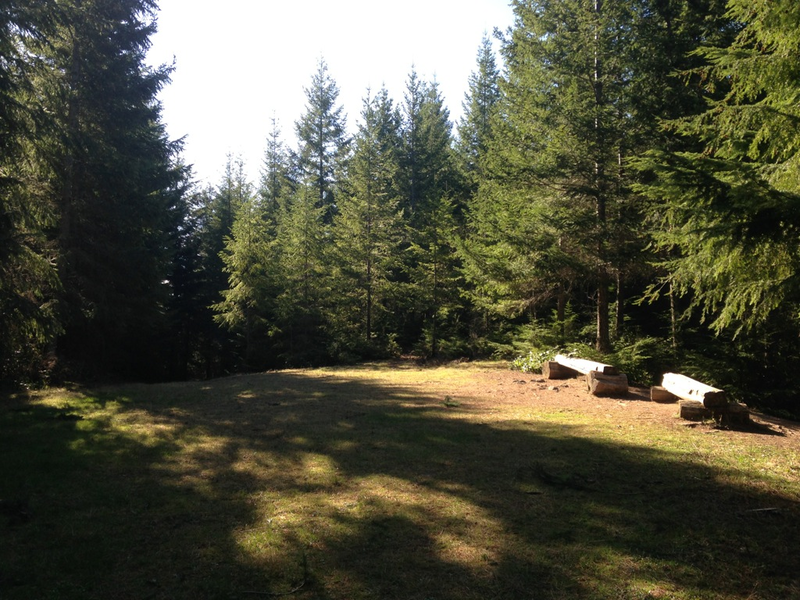 Though offering a limited view, the summit does feature a nice grassy place for a picnic. Grassy space at the top. = The Hugo Peak Trail was mostly clear of downed trees and some maintained raised planks cross the wetter areas. Signage throughout the trail was fairly good, although the trail becomes more difficult to follow near the top when it intersects with some dirt roads. Follow the narrow brown trail signs closely here. The amenities at the trailhead leave much to be desired though. The shuttered bathroom (at least during the offseason) is disappointing. 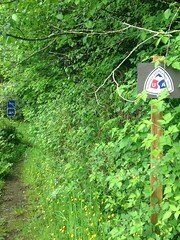 Parking is limited at the trailhead near the entrance. However, if you drive a little further down the road you can reach a picnicking area with more parking space. = If coming from the South Sound area, Pack Forest is roughly located two-thirds of the distance to Rainier National Park. It’s fairly secluded but fortunately accessible from right off of National Park Highway (Washington State Route 7). I recommend Pack Forest especially if you don’t want to spend money to enter the national park or if you want to try some hikes a little closer to home. 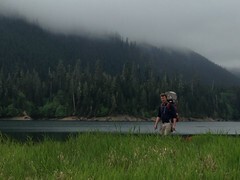 = Overall, Pack Forest features a great diversity of environments. The Little Mashel Falls on the east side of Pack Forest are a popular destination. Furthermore, exploring into the interior, such as to the Trail of the Giants, lets hikers experience some amazing old growth. That said, the Hugo Peak Trail doesn’t feature quite as much diversity, however, it does wind through some pretty older growth sections. 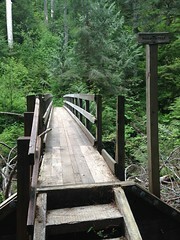 Where: Find the main entrance to Pack Forest and the Hugo Peak Trailhead (located directly at the entrance) off of Washington State Route 7 just past its intersection with Route 161. The entrance will be on the left side if you’re headed towards Rainier NP. Park to the right of the entrance building or, if there are no available spaces, drive a few hundred feet down the road to the picnic area on the left side. When to Go: As far as I know, Pack Forest doesn’t close. If you’re up for some longer hiking, I would make a day of visiting the forest and explore the falls, Hugo Peak, and possibly Trail of the Giants. Altogether, that might take four or more hours of hiking, but you could experience the best parts Pack Forest in one visit. Trail Information: The out-and-back trail to Hugo Peak is fairly straightforward. Towards the top, it becomes more complex when the Hugo Peak Trail connects with some dirt roads. Along the way up, it crosses over some other little-used dirt logging roads. Check out the map before you go and learn a little more about Pack Forest’s public use rules here. Read the WTA description of the trail here. Also, you can take dogs to Pack Forest, however, they should remain leashed. Clover leashed up and ready to go.